Chocolate is a decadent treat for our taste buds; creamy, sweet, with richness exploding from all sorts of flavors and nuances. In this way chocolate and cheese are alike. In fact, many of the ways in which we taste, talk about, and experience chocolate cross over to how we talk about cheese. So what better way to celebrate the love of chocolate than gathering a group of chocolate-loving friends, and having a cheese and chocolate tasting party? Like cheese, chocolate can range in all sorts of colors, flavors, and textures. Exploring various types of cheese and chocolate and comparing notes is a great way to expand your palate and your knowledge of these tasty treats, and just have some fun! Hosting a tasting doesn’t have to be complicated or difficult; let these simple tip and ideas be the guide to your own personalized tasting party. One of the best things about cheese and chocolate is that pretty much everyone can find something that suits their taste buds. Your party can be completely kid-friendly (the kids love their cheese and sweets just as much as you do)! You can also keep it an adult affair and go bold and interesting just as easily or really anywhere in between. A good size, manageable tasting is between 6-8 people with 3-5 pairings. It’s an intimate number of people, won’t overwhelm your palate, and can be cost-friendly to your wallet. You want to be able to have everyone share their experiences and not get overwhelmed too early in the process. Pacing and selecting the right number and size portions will ensure that everyone has a great time and can discover their favorite pairings. 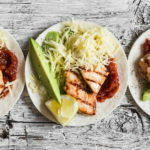 You can plan on hosting your party in the mid-afternoon or mid-evening, however, the most important detail is to do your tasting at a time when people can arrive when they are ready to eat but not starving. If they arrive full, having eaten recently, or really hungry it will affect their tasting experience. Just like your stomach, your palate can become overwhelmed and desensitized. For the best experience you want your palate to be fresh; small portions and a ready palate are keys to success here. Choose between 3-5 interesting chocolates to try. It doesn’t matter whether you pick the cheeses or chocolates first but whichever you choose first will help drive your choices for the other. Remember, don’t go overboard, we don’t want to overwhelm the guests’ taste buds. So aiming for a range of chocolates or cheeses is great way to go (think mild to medium, subtle to bold, etc.) Starting simple and ending with the more complex flavors will create the best experience. A great idea is to find a local chocolatier, or specialty cheese shop; they can have great suggestions for your party as well as flavors that you might not ordinarily find. Don’t be afraid to explore new things, and try organic or regional products, dark chocolates, or products with interesting ingredients added. All the variety can be a fun talking point while your guests are enjoying the different tastings. These shops can also be a great resource to help you understand the products flavor profile which will be helpful in arranging your tasting. Once you’ve picked your chocolates, be sure to buy enough so each guest can have a square, or piece of each flavor. For the cheese, you want guests to have an ounce or so. This is just a tasting so you want them to have enough to explore different combinations freely but not to get too full too quickly. Here are some suggestions to get your creative pairings flowing! 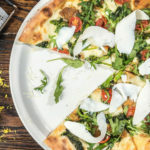 •	Soft ripened cheeses and goat cheeses can be on the more acidic and on the pungent side, but these aggressive flavors make them well suited to pairing with a variety of chocolates, both milk and dark. Dark chocolates with balancing notes are a great choice as are chocolates with deep cherry, nutty, and fruit notes. •	Even the biggest opponents of blue cheeses can be won over by the sweet and salty combination of this cheese with honey flavored truffles and chocolates. For another treat try blue cheeses with strong dark chocolates; those with higher cacao percentage are sure winners. Steer away from chocolates that are too salty since blue cheese can also be on the salty side. 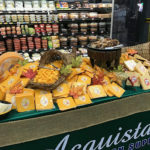 •	Aged cheeses have amazing texture and flavor that lend themselves very well to pairing with a variety of chocolates. This is one category where you can go incredibly wild with options. From spicy to fruity, maple flavored to nutty; aged cheeses lend themselves to the greatest exploration. Try creamy flavored salted caramel and compare the salty, crunch, caramel notes of the candy to those found in the aged cheese. 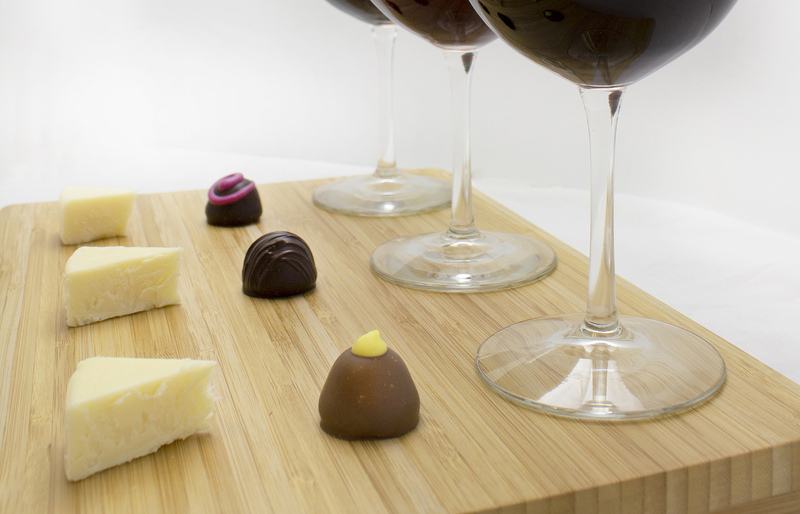 •	Beer, Wine, Espresso, flavor washed cheeses can make for amazing pairings with chocolate. Think of approaching this category the way you would cooking. What types of flavors go well with espresso? Or wine? Let this be a guide for the pairings you create here. For instance, try a chai rubbed cheese with a coconut truffle or spiced milk chocolate. When you’ve made your selection and you are ready to set up the tasting you can set them in pre-paired sets (one chocolate, one cheese) to start with. This will encourage your party goers to jump right in and work towards random pairings later. Cut the cheese into small cubes or chunks and let it warm up 45 minutes to 1 hour before the tasting at room temperature. This will allow the full flavor of the cheese to emerge. Be sure to provide some sort of palate cleanser for your guests to have between tastings. A glass of water, some fresh grapes, and some bland crackers can do the trick. This will help your guests’ taste buds keep from getting overwhelmed. Before the tasting, you can find (or make) a sheet for each guest to write down all his or her tasting notes. Here you can download some example tasting cards to use. This will help them pay attention to the qualities of the chocolates, such as, color, aroma, texture, flavor, and finish. You can even create a rating scale to help them pick their favorites. Try including a list of descriptor words to help people if they get stuck. Encourage your guests to express what they taste, even if it seems off the wall because no two tasters are exactly alike! Other than these simple guidelines there are really no rules when paring. The goal is to experiment, explore, and discover the pairings that reward you with new taste adventures!